Published on 18 October 2012. It’s only today that I’ve realised that this is no longer called the GMEX, despite it being quite some time since it was renamed. It was, of course, formerly Manchester Central station, until the disastrous Beeching axe left this as one of 2,000-or-so stations without a railway line. From 1969 to 1986, the building stood empty, but it was then developed into the GMEX, or Greater Manchester Exhibition Centre. 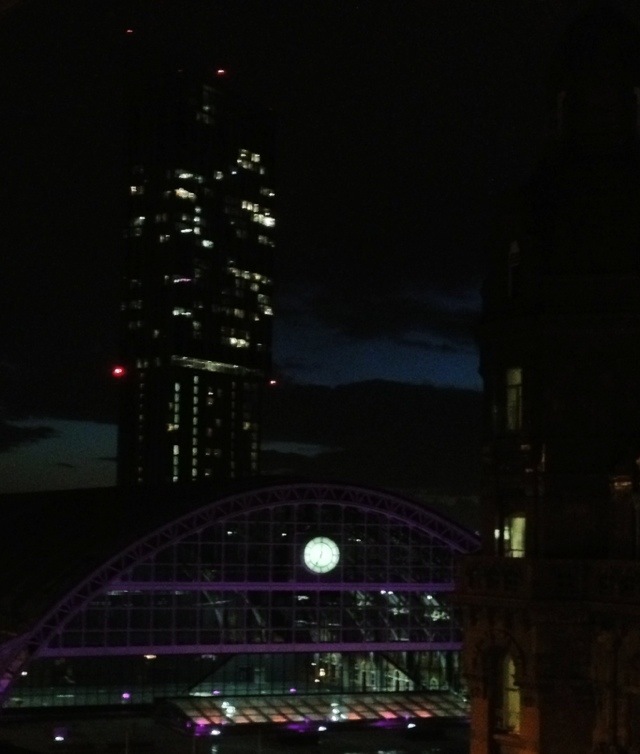 Its facilities have been extended, refurbished, and revitalised several times since, and in 2007 it was renamed Manchester Central in homage to its history. It retains Britain’s second-widest unsupported iron arch after the one at St Pancras. In the background is Britain’s tallest building outside of London, the 47-storey Beetham Tower. This dull name comes was given by the developer, which has also given its name to towers in Birmingham, Brighton, Liverpool and London, showing a quite considerable lack of imagination. This 1,854th post was filed under: Photo-a-day 2012, Manchester.